Willard Peveler is an assistant professor of exercise science at Northern Kentucky University and is the author of "The Complete Book of Road Cycling and Racing." He has coached cycling at the collegiate level and triathlon for Team in Training. His research involves factors affecting performance in cycling and triathlon. 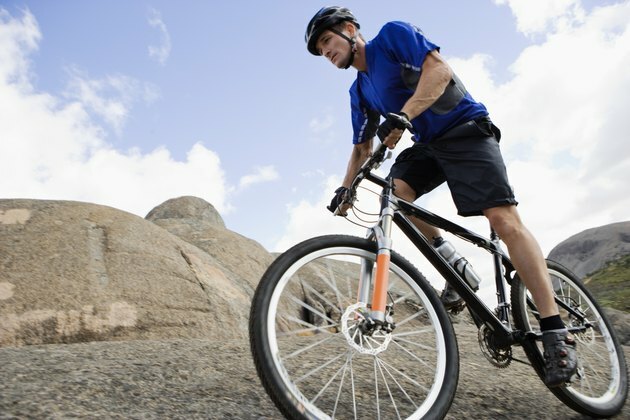 One of the key considerations when purchasing a new bike is frame material. Two of the most common frame materials are aluminum and carbon fiber. Understanding the advantages and disadvantages of each material will help the consumer make an educated decision on his purchase. In general, carbon fiber frames are lighter than aluminum frames. The quality of the frame will ultimately determine weight. A well-built lightweight aluminum frame could weigh less than an inexpensive carbon frame. In order to create lightweight frames, tube thickness is varied throughout the length of the tube. Tubes will be thicker in areas that are under heavy strain and thinner in areas that are not. Aluminum frames possess the shortest fatigue life of any material used to manufacture bicycle frames. The typical aluminum frame possesses a life expectancy of five to 10 years. Conversely, carbon possesses the longest fatigue life. Most manufacturers provide a lifetime warranty on carbon frames. Some manufacturers offer a lifetime warranty on their aluminum frames, but most offer five to 10 years. Aluminum frames are stiff, allowing for optimal transfer of human power to forward motion, which makes an aluminum frame a great choice for sprints, time trials and criteriums. However, a stiff frame can be extremely uncomfortable on long rides. The properties that make aluminum stiff also transfer road vibrations directly to the rider. Adding a carbon seat post, carbon fork or carbon handlebar can help dampen road vibrations and increase comfort when riding an aluminum frame. The process of manufacturing a carbon frame allows the builders to place the carbon weaves in a manner that provides stiffness, yet dampens road vibrations. Carbon frames are just as stiff as aluminum, but dampen road vibrations, providing a very fast and comfortable ride. Of the two materials, aluminum is the least expensive. However, due to trickle-down technology, carbon frames are becoming more affordable. You will need to decide the cost benefit between the two materials. You will need to choose the frame material that best suits your riding needs and your current budget. Aluminum frames are a good choice for riders on a tight budget who want optimal performance. Carbon frames are ideal for those riders seeking comfort on longer rides or those seeking optimal performance. Ride both frame materials prior to purchasing in order to determine which best fits your needs. What Is an Alloy Bike Frame?